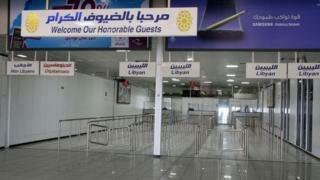 The only working airport in Libya's capital, Tripoli, has diverted flights after it came under rocket fire. There were no immediate reports of damage or casualties at Mitiga International Airport after the attack on Tuesday night. The airport had only reopened on Friday following clashes between rival militias. A UN-backed government is nominally in power in Tripoli but militias occupy much of the rest of the country. Is it possible to hold elections in Libya? The rocket attack forced a Libyan Airlines flight from Alexandria in Egypt to divert to Misrata, some 200km (120 miles) east of the capital. Other flights would also be diverted and a source told Agence France-Presse that plans were under way to move other planes at Tripoli to Misrata. Libyan Airlines is the only operator, running internal flights and international ones to a limited number of countries. It is barred from EU airports on security grounds. How realistic are Libya's election plans?